"My research has focused on what causes established companies to maintain success, and The Startup Way provides practical guidance on how to do just that." "If The Startup Way can transform the federal government -- and it has -- it can transform your company. For everyone who's thought 'there has to be a better way,' here's your proof and a playbook to make it happen." "Big companies are struggling as never before. They need a brand new stem-to-stern game plan, and they get exactly that in Eric Ries' new book The Startup Way. It keys off The Lean Startup and makes a great leap forward. The game plan Eric suggests is 'not optional' for our bumbling big outfits. Well done!" 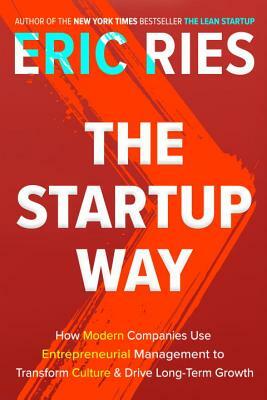 "In The Startup Way, Eric Ries uses his years of work with companies like GE and Toyota to show us what the company of the future will look like. If you want to know how companies can become more agile, more innovative, and more resilient in the face of today’s relentless pace of change, this is the book for you." "A future classic, a book that will inspire thousands of companies to leap into a much needed re-invention." "Eric brilliantly describes the limitations of old management thinking in a time where competitors bring out new products an order of magnitude faster than legacy companies. The Startup Way describes how to foster entrepreneurial leadership essential to corporate survival in the 21st century." “Eric Ries shows that entrepreneurial management is a key to success in this fast-changing world. At ING we’ve embedded lean startup principles into the way we innovate, The Startup Way brings new and valuable insights"
"Eric has done it again! Every company can benefit from these startup principles -- and should -- because if they don't, a startup is probably going to drink up all their milkshake. This is the internet revolution and if your company isn't adapting to The Startup Way, it's failing."